It is unusual to be treated to two equally splendid works in one evening; both are especially admired by the Egyptian listeners and are natural audience magnets. And 16 June being the first day of the presidential runoff elections didn’t stop many music lovers from attending. All gathered for the buildup to a promising evening that included Nicolai Rimsky-Korsakov’s Scheherazade and Beethoven’s Symphony No. 5 in C minor, Op. 67. For decades now, Beethoven’s Symphony no. 5 has been performed by the the Cairo Symphony Orchestra, conducted by principal and guest conductors. One of its most memorable interpretations was Daniel Barenboim’s, back in 2009. This time it was El-Saedi’s turn to look into this iconic work whose creator is known to have stated: “I must write… for what weighs on my heart, I must express… I live only in my music… With whom need I fear to measure my strength?” As such, to date, Beethoven’s scrutinizing eye seems to be on the conductor’s shoulder, waiting for yet another interpretation of the work of which the composer doesn’t try to hide his pride. 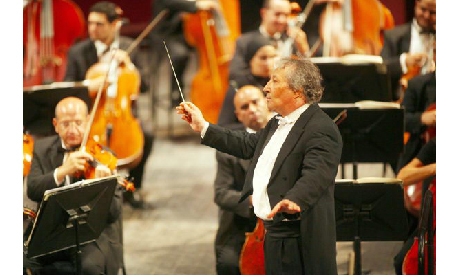 Ahmed El-Saedi is a conductor with a significant resume of orchestral achievements. He was the Cairo Symphony Orchestra’s music director and principal conductor between 1993 and 2003: years during which the orchestra reached remarkable artistic levels and its excellence was Egypt’s pride and joy in many international halls. Following the 2003 divorce, many foreign conductors took the destiny of the orchestra into their hands; some of them added important values to the orchestra; others, however, contributed to the instability of its artistic output. Every listener recognises Beethoven’s Symphony No. 5 from the first four notes – Sol Sol Sol Mi bemol – which open the first movement (Allegro con brio). This is the so-called fate motif, a term based on a bogus story that has nonetheless lived on. This is the core molecule that keeps going through endless permutations, transformations and combinations. As the conductor leads us through this gigantic structure, the baton balances the rhythmic elements and controls the pauses. The molecules and their offspring are independent elements that create a complete puzzle; and musically they form a solid, uninterrupted flow. Through a number of rough cuts, El-Saedi stresses Beethoven’s technically brilliant components. Yet, at times, the same lines resulted in a loss of the necessary, evenly lustrous scent: a fact that gave a mechanical numbness to the first movement. A delicate energy shift is welcomed by the long bows opening the second movement (Andante con moto). Within the first note pronounced by the strings, the conductor chooses the musical texture unveiling the most beautiful melodies, leading to many soothing realisations and a series of variations. The fraction of a second when the bows hit the strings is the decisive moment, placing basic sketch lines of the energy in that movement. During this evening the strings were approached harshly and the orchestra took its time to regain the musical balance and expressive softness in the following bars. By the time the second theme appeared in clarinets and bassoons, the orchestra managed to loosen up, and the music glowed – allowing all the woodwinds to convey their respective, delicate colours. The third movement (Allegro) consists of scherzo and trio: from a sense of anticipation to a joyful fugal style, from pianissimo linings to the dynamic crescendo, the movement is an independent sculpture which, when managed well, takes the audience through a multitude of emotions punctuated by strong surprises. There is enormous space for push and pull. Each time, the listener is about to grasp Beethoven by the sleeve; the composer, again and again, makes an escape and rises above all expectations. Coming from the previous Andante movement, the orchestra took off with a gentle sense of suspense, a level to which it could no longer return taken by the strong winds of more dynamic parts. While approaching the end of the movement, most of the necessary spaces between the contrasts started to shrink. And it was the fourth movement (Allegro) that gave the orchestra the freedom to move into the deep waters of great Beethoven’s sound. Though well performed, again, the stronger dynamics kept stealing the energy from piano parts. Nevertheless, the triumphant greatness of that closing movement managed to take its balanced breath, needed particularly in the presto part.